Piano Safari > New School Year! I trust all of you have settled into your new school year routines with your students! I wanted to share with you some things I am doing this year with my students. It’s nothing fancy, but I find that new charts and organizational structures are very motivating for students, and help me to gauge how the student is progressing throughout the year. I had Parent Teacher Conferences with all my students the second week of lessons. I have not done this before, but I thought it would be helpful to set expectations for the new school year and talk with each parent alone. During the first 15 minutes of the student’s lesson, I asked the student to practice in my studio while the parent and I sat at the dining room table. 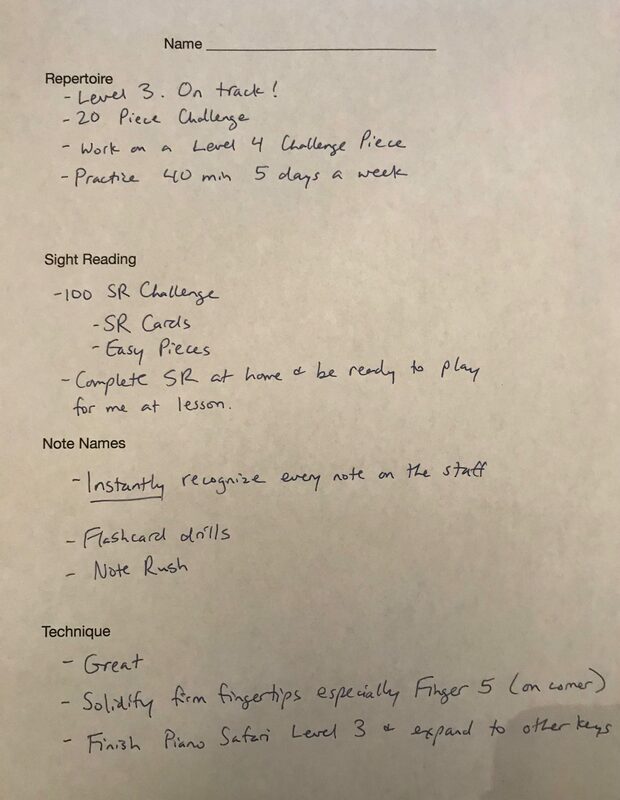 I had a progress report for with talking points for the four big topics of lessons we are focusing on: Repertoire, Sight Reading, Note Names, and Technique. Then we talked about the length of practice expected and when practice time is scheduled (before school, after school, how many days, etc.). It was very enlightening for both the parent and me to hear what goes on at home from the parent’s perspective (Me: “For your child’s age and level, they should be practicing at least 40 minutes 5 days a week.” Parent: “Really? She’s only been doing about 20 minutes. We will make it happen!”) If we don’t tell the parent, they don’t know, I discovered! It was a great chance to reset expectations and to see what each student’s schedule looked like. The parents were very thankful to have the conferences. I think I will make this an annual event. Last year I had a 30 Piece Challenge, but I decided to lower it this year to a 20 Piece Challenge, because I want to push the students a bit to play harder pieces (mixed with easier pieces, of course) and also to refine pieces more carefully. 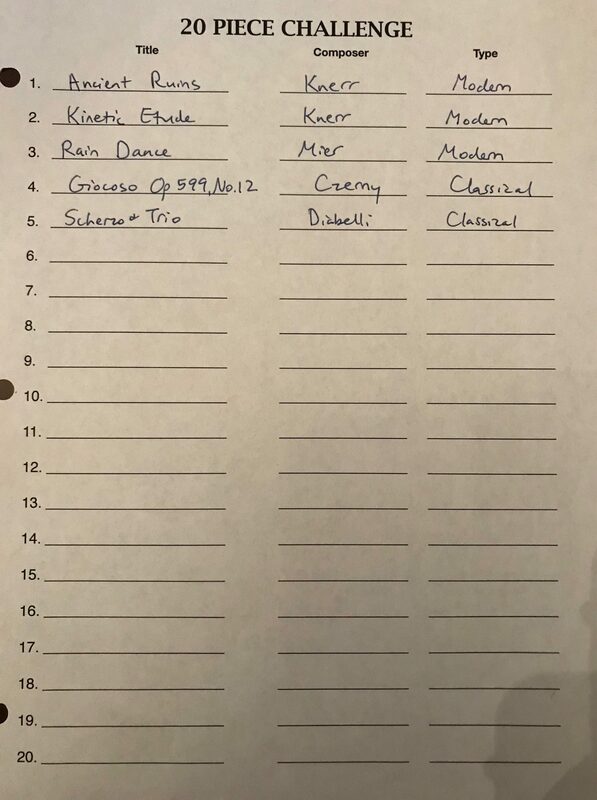 Most students learn far more than 20 pieces in a year (Level 1 students can learn 80 or more), but I thought it would be good to give them something attainable, and just give them a new 20 Piece sheet as they need it. Another reason I lowered the Piece Challenge was because of the 100 Sight Reading Challenge. This is a combination of Sight Reading Cards and very easy pieces from various books I lend out. I spent an embarrassing amount of money on stickers this summer, so I have cat and dog stickers to put on the chart. Some of the students are very particular about the color and type of dog and cat they use! So far I have more dog lovers than cat lovers in my studio. I am a cat person who is allergic to cats. Therefore, I like to watch cats and dogs on TV only. For some students who need an extra motivation, I am offering chocolate rewards. As they finish each 20 Piece Challenge sheet, they receive a large candy bar of their choice. As they work on the 100 Sight Reading Challenge, I ask them if they would prefer to have a Big Chocolate Bar at the end of the 100, or Sporadic Chocolate. I tell them, “Under some of these white boxes are little chocolates. You don’t know which boxes they are under (hint, it is tied to how well you practice your Sight Reading).” So they can choose between the Big Chocolate at the end or the Sporadic Chocolate along the way. 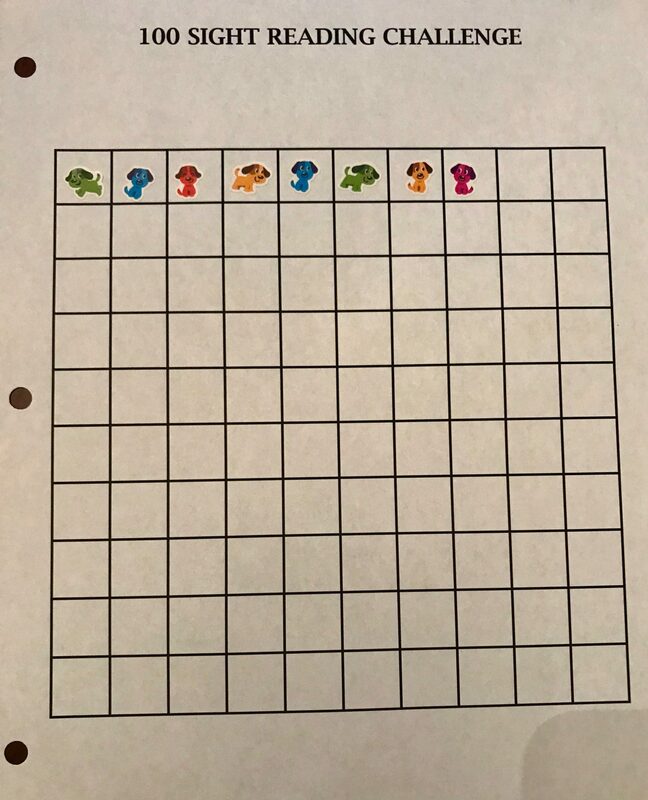 I have also made charts for learning Note Names and for some aspects of Technique, depending on level, but that is for another blog post! 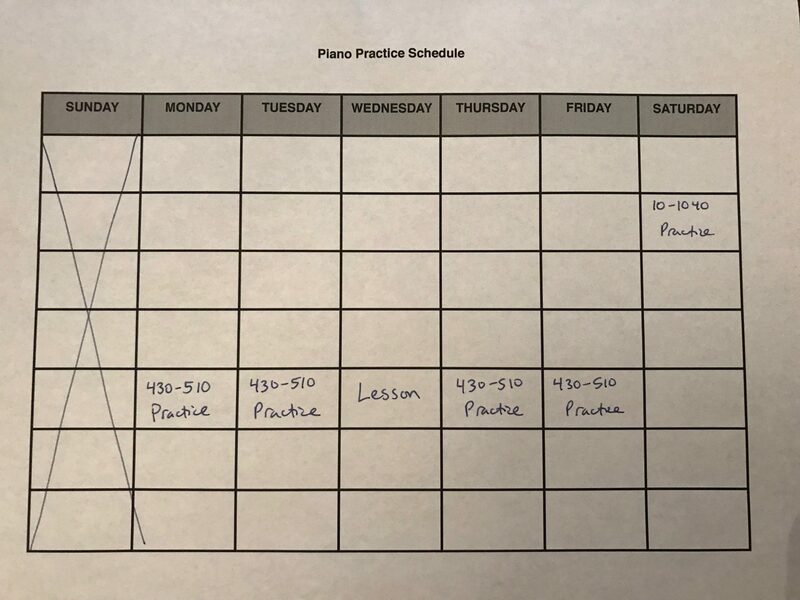 Please share what you are doing in your studios in the Teaching Piano Safari Facebook Group or as a comment on this blog post. I hope your year is off to a great start!